Facing a large backlash, resignations, and protests, the Canadian Bar Association (CBA) has decided that it will not make an intervention at the Canadian Supreme Court in the case involving Chevron Corporation’s contamination of the Ecuadorian rainforest. The CBA’s legislative and law reform committee had recommended against proceeding. Meanwhile the environment, aboriginal, and civil litigation committees has urged the CBA not to intervene on behalf of Chevron. Kathryn Deo, who had resigned from the CBA in protest told the Globe and Mail “I’m sure it was a difficult decision but it was clearly the right decision and we are appreciative of their courage in reversing course.” Lawyers in Canada were upset that the board of the CBA had authorized a law firm with ties to Chevron, Blake Cassels & Graydon LLP, to submit the brief. At issue is whether the Ecuadorian plaintiffs can seize the assets of Chevron corporation in Canada in order to collect a USD $9.5 Million judgment against Chevron for the contamination it cause in the Lago Agrio region. The Ontario Court of Appeal ruled that the case could indeed be heard. Chevron has appealed to the Supreme Court of Canada, which will hear the case in early December of this year. 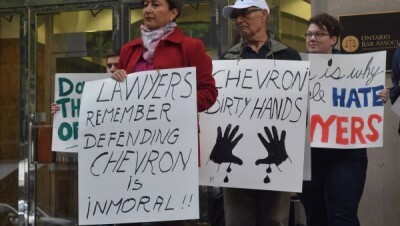 Chevron maintains that courts in Canada have no jurisdiction in this case, should the Supreme Court rule against them, the full judgment could be collected and paid to the Ecuadorian plaintiffs.